What's history's most awesome failed electric car? Getting bitten by the electric-car bug isn't just a 21st Century phenomenon. There's a whole history of failed electrics from which to draw, when considering what might have been. What's the most awesome failed electric car ever? A Gallup poll in 1966 indicated that 33 million Americans were interested in electric vehicles. That set off a race, of sorts, to deliver a serviceable electric car to US buyers. The 1970 Federal Clean Car Incentive Program added fuel, so to speak. We know how it all turned out, but during the subsequent decade-long rush to get an electric car built, many tried, and all failed. 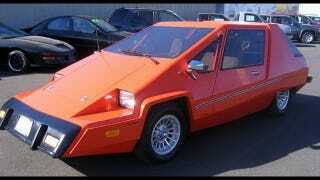 But the most awesome was naturally the Legrand Electric Car. Sprung from the pages of Popular Mechanics magazine, nothing said 1970s scifi quite like the Legrand, whose 8hp motor got power from twelve 6-volt batteries to push the VW Beetle-based EV to a top speed of 55 mph at a range of 80 miles. It also came with two six-foot roller-disco babes in hot shorts and seven-hundred kilos of cocaine.